Can Biogen win where Eli Lilly failed? According to Weisman, recent research by Biogen confirmed data indicating that aducanumab decreased levels of plaque among individuals who continued to take the drug after the clinical trial was over. This was encouraging—both to the people who took part in the clinical trial and, of course, to Biogen and its investors. Yet Weisman noted that optimism was “tempered” about the drug candidate because a biotechnology analyst estimated that there was only about a 35 percent chance that the drug would ever be approved. In the world of Alzheimer’s research, however, anything better than a one-in-three chance sounds highly encouraging. Keep in mind, of course, that the only Alzheimer’s drugs on the market today are Aricept and a few other drugs, none of which claim the ability to hinder the disease’s progress, let alone stop it. So any genuine progress to slow the disease would be a big deal. Nothing will happen overnight, of course. According to Weisman, Biogen’s forthcoming clinical trial will be mammoth—as many as 3,000 participants spread among twenty nations. Will I be volunteering? I hesitate because I seem to be able to bear Aricept at only very low doses, and I suspect that would be the case with the drug in the Biogen clinical trial as well. I cherish my sleep—as anyone with Alzheimer’s should—and I’m wary of being knocked off my daily regimen by poor sleep hygiene. Is it possible to simulate the symptoms of late-stage Alzheimer’s, so people without the disease can experience the condition vicariously? That was the question of a television journalist whose father had died from Alzheimer’s. The journalist, Monica Robins, moved to the Cleveland area in the late 1990s so she could care for her father. After he died, Robins arranged to go through the “Virtual Dementia Tour Comprehensive Program,” created by the company Second Wind Dreams, in order to get a better understanding of what her dad went through. One of the first steps in the simulation involved putting inserts in Robins’ shoes, intended to simulate neuropathy—the sensation of pins and needles. She then was told to put on a half dozen pairs of socks, to create, presumably, the difficulty of walking after suffering nerve damage in the feet. “What?” Robins exclaimed, when she heard the directive. Another simulation involved compromised peripheral vision, which makes driving a car hazardous. Deeply confused by this time, Robins asked, plaintively, “What am I supposed to do?” Soon she had to attend to another task. A moment later she returned, musing “about a belt,” but failed to understand the context. Another task was to read five instructions posted on a wall. By that time, Robins was bewildered, and could remember only one of the directives. Robins, however, may have been too hard on herself. After all, it was her father she was caring for, not some stranger. How not to feel some inadequacy, if for nothing more than the lack of being able to do the impossible? And I, too, occasionally ponder what late-stage Alzheimer’s might be like. 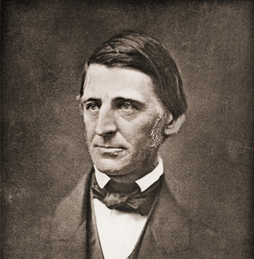 I recall reading that Ralph Waldo Emerson, one of the great minds of the nineteenth century, seemed relatively serene in his final years, despite his dementia, which manifested itself as aphasia (the loss of language, an especially cruel fate for someone who was exceedingly articulate). Still, the Sage of Concord is said to have maintained his equanimity. “I have lost my mental faculties but am perfectly well,” Emerson purportedly said. With the holidays approaching, my next blogpost will appear on Friday, December 30. Sometimes I need a break from writing about Alzheimer’s. The litany of failed drug candidates is too long, the supposed progress largely illusory, to provide me or my cohorts much in the way of hope. 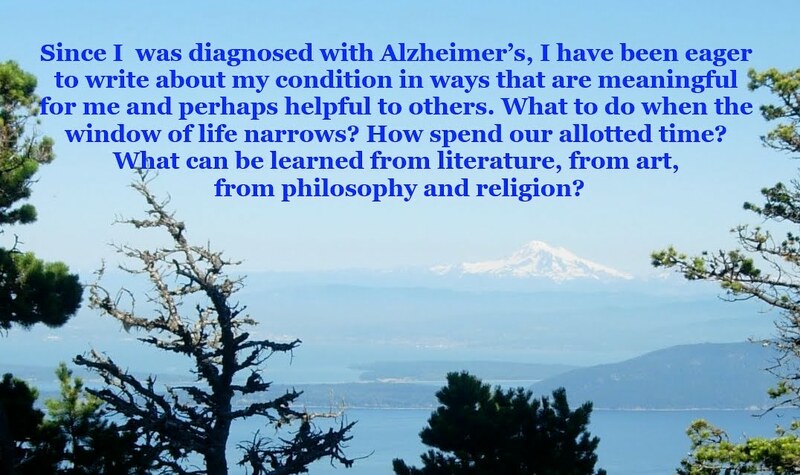 That’s why, in the summer of 2015, when I was preparing to launch this blog, I sought to give myself some space to occasionally barely mention Alzheimer’s at all. Lately I’ve been thinking of Pete Oswald, a friend of mine from high school. We met on the football team. Pete, one year ahead me, was the team’s center, in more sense than one. Anyone who has played high school football is likely to remember at least one teammate who took great glee in bullying the underclassmen. Pete was the opposite. In his sophomore season, if not sooner, he’d learned humility. He’d developed a stubborn illness that fall, and though he soldiered on, he associated that season with the smell of the drying, soiled football gear. It was an unpleasant association. But by the time I became acquainted with him, he reported that he’d come to like the smell—not because of the particular odor, of course, but because of its association with his illness, which now was in the past. And through his years of high school, he remained steadfastly loyal to his childhood friends, none of whom were jocks. After Pete graduated, he enrolled in the engineering program at Harvey Mudd College, west of Los Angeles. He played on the school’s football team his freshman year, but by then he had a higher ambition: to transfer to the Naval Academy. There, too, he played football, earning All-East honors his senior year. In retrospect, the decision to follow a military path was almost inevitable. Pete’s father, Harold Oswald, was a Navy pilot during World War II. My friend Scott, who also was close to Pete, suggested that the senior Oswald was stationed in the Aleutians, from which pilots could carry out bombing raids in the north Pacific. After the war, according to Scott, Pete’s dad was stationed at the Whidbey Naval Air station, north of Seattle. The graceful bridge north of the naval station is an architectural marvel. It was also alluring to Harold Oswald and one of his fellow pilots. Sometimes they would fly under the bridge—a practice that was halted after one of the pilots clipped a wire, possibly a power line. Pete himself was the baby of the family. He had two much-older brothers, including a Navy pilot who went on to become an astronaut. (I remember, sometime in the mid-nineties, getting a postcard from Pete noting that he was in Houston, because his brother had “just got back from space.”) Pete had wanted to follow his brother’s path to become a pilot, but his eyesight was subpar. Instead he eventually became a Navy SEAL. From the letters I received from him during his first months at Annapolis, it was clear that he was unhappy. He was admonished, for example, for having a poster of Jimi Hendrix in his dorm room. When he was visiting me at my apartment, not far from Western Washington University, he remarked that when he heard Hendrix’s “Purple Haze”—it was playing on my stereo—he wanted to fling himself over my balcony. At nineteen, he was eager to jump out of planes, and, many years later, when he was living in Coronado, California, jumping out of planes was part of his job. But that was deep into the future. When I saw Pete at Christmas break in 1981, he was in a bleak mood. We drove up an old logging road on Chuckanut Mountain, just south of Bellingham, and as we surveyed the dark islands to the west, drinking our beers, Pete confided that he wasn’t sure he wanted to go back to Annapolis. He feared that he was too irreverent, or that he couldn’t endure the military strictures. But he did find that he had a sense of mission. 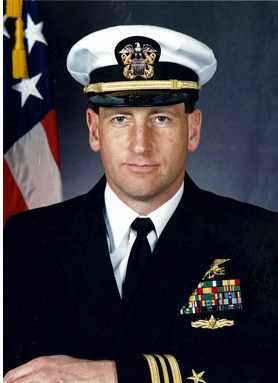 While serving on a nuclear submarine in the north Atlantic, he described the submarine’s role as “keeping the world safe from itself.” He also told me about the armed guard, whose role was to make sure that some deranged sailor didn’t get access to the Trident nuclear missiles waiting in their bays. A couple of years later, stationed at the Puget Sound Naval Base in Bremerton, Pete compared his circumstances to the old sitcom McHale’s Navy. The enlisted men maddened him. By then I was living in Waterbury, Connecticut, and, in a happy coincidence, Pete ended up studying at the Naval War College, in Newport, Rhode Island, just a couple of hours away by car. For more than a year, I saw Pete regularly. I particularly remember a weekend ski trip we made to Killington, Vermont, in early March 1985. The night before, I’d thrown up from the flu, but being a 23-year-old guy, I made the trip anyway. I remember skiing vigorously during the day, and throwing up at night. It seemed the reasonable thing to do. Only when I got back to Waterbury did I grasp just how sick I was. After several more encounters with Pete that year, he left New England for good. The last time I saw him was the summer of 1989, when we both happened to be in Bellingham. A year later, Pete was preparing for the Gulf War, which turned out to be a lightning-swift campaign. At the time, I had no idea that Pete was serving. (Of course I didn’t. His mission, after all, was clandestine.) It was not until I visited Scott in Bellingham in September 1992 that I grasped that Pete had seen combat. The proof was in the photo—which, if I recall correctly, included the charred remains of an Iraqi vehicle. Nor did I know that later in his career he spent three years in Japan, where he became fluent in the language, or that, a few years before the Gulf War, he oversaw mine-sweeping operations during the Iran-Iraq war. I never saw him again. But in the mid-nineties he reached out to me. I was surprised to learn that Pete, too, was a writer. He appreciated the time I spent poring through his draft of his novel. It was no surprise that I failed to make it back to the funeral in Bellingham; by the time I learned the news of his death, my friend was already in the ground. What was the meaning of Pete Oswald’s life? What is the meaning of any life? Maybe the better question is, “How can I make the most of my remaining time?” You never know when fate might connect on a haymaker. At the time of Pete’s death—he died in a military-training accident in El Salvador near the end of August 2002—he had a wife and three young daughters. File this one in the “life isn’t fair” department. But it’s worthwhile, as Flannery O’Connor sort of put it, that one should be ready to die at any moment. You may not know when your number comes up. I am becoming impatient. Season by season I sense my faculties eroding. Yes, I understand that mine is a progressive disease, and, as far as I can tell, my rate of decline is a bit slower than the norm. Four-and-a-half years since my earliest symptoms, in most social situations I can pass for normal. But drop me off alone at an airport, and my anxiety will spike. And require me to change planes in, say, O’Hare Airport, en route to Seattle, with limited time to catch my connecting flight, I would be courting disaster. The ever-flipping electronic boarding times seem part of a system-wide cruel joke on impaired travelers. Just as I would find the SEA abbreviation, I would lose sight of the flight number. I would have to set down my carry-on luggage, pull out a mini-notebook from my jacket pocket, concentrate my hardest, and hope to jot down the correct gate number and time. It’s unlikely that I will fly alone again. And yes, I am aware that many people are far worse off. I’m not only talking about people with Lou Gehrig’s disease, one of the cruelest neurodegenerative diseases. I’m also thinking of B. Smith, the African-American fashion maven who is now well into the middle realm of Alzheimer’s three stages, despite being diagnosed only about three years ago. What frustrates me is the parade of failure of Alzheimer’s drug candidates. Many of us know that the vast majority of Alzheimer’s drug trials end in complete failure. If Alzheimer’s researchers, some of the smartest people on the planet, were a baseball team, their collective batting average would be not much above .000. There are only a few drugs on the market, and the best-known one, Aricept, provides limited efficacy. The latest disappointment came, rather cruelly, just before Thanksgiving. The Boston Globe reported that Eli Lilly didn’t get over the efficacy bar to continue with their research. The company had already learned that their drug candidate would not halt the disease. What else is new? But there was alluring hope that the drug would slow the pace of the disease, and that gave people like me optimism that we might enjoy a significantly wider window before we reach the disease’s extremely unwelcome final stage. “We didn’t get the results we wanted or expected,” a spokesman stated. Isn’t this the way that Alzheimer’s trials always end?